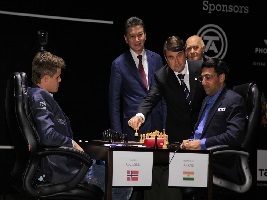 World Chess Championship 2014 – Magnus Carlsen vs Viswanathan Anand 1/2-1/2: Version 2 of the Anand – Carlsen clash for the top title in Sochi, Russia. The first game displayed a strong resolve by Vishy Anand to fight all the way. Carlsen, as well, came armed despite a dull year behind him vis a vis not-too successful tournaments by his standards. The first game was an interesting draw. Replay the game below with Chess King. Find a detailed report at Chess Blog.